How Should We Budget $5000 of Discretionary Income? Not many people can say they have extra discretionary income kicking about every month where they have to drum up ideas about how to spend it. For those of you that do you can still manage that money with a budget if you want to stay on track with your financial goals. When Mrs. CBB and I paid off our mortgage in April 2014 it was a grand time for us. We managed to break down our mortgage into pieces and pay it off far sooner that we had ever dreamed of. The reason that happened was due to perseverance and a drive to be successful at whatever we did. I guess in a way we were pushing ourselves to earn more money but we knew in the back of our minds that it was all stepping-stones for our dream career roll. Now that our mortgage is paid we have lots of discretionary income which we just recently worked into our budget. Lots of people would be more than tempted to start spending money especially if they’ve hit it big time and the money is rolling in. What is Discretionary income vs. Disposable Income? Disposable income (also known as DPI or Disposable Personal Income) is what you have left after you have paid the tax man his cut of the money. It also means your net income or what you take home after your taxes are paid. That means if you earn $100,000 and you pay $40,000 in taxes to the government your disposable income is $60,000. It’s not play money yet though because now you need to budget that money which will help create a monthly financial plan. 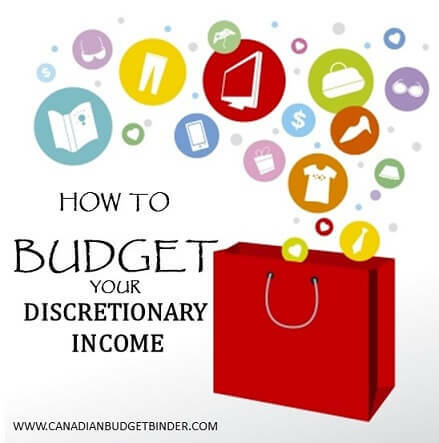 Discretionary Income is a bit different, it is the amount of money left after paying the tax man and all of your bills every month such as mortgage, rent, groceries and other bills. You may have heard the term “Play Money” for this because it simply is extra cash laying about waiting to be managed. Mrs. CBB and I have since managed to budget most of our discretionary income by investing extra money into an RRSP and TFSA so now we are maxing out every year. If you have a look at our June 2015 net worth update you will see just how much our investments increased because of the recent changes using our discretionary income. Today CBB fan Josh has written to me looking for tips on what they should do with their extra discretionary income. It’s not just a $1000 or even $3000 a month it’s $5000. My wife and I both have successful careers where I work in TV and she is a registered nurse. Together our gross income is $150,000 but after taxes we have about $90,000 net to play around with in our monthly budget. We recently graduated and got married so it’s been a busy few years for us. We met online on the dating site Plenty of Fish while going to school. Studying was the norm for us and although we went out to the clubs every so often it was hard to meet people. Falling in love with my wife was not hard to do as she is beautiful, outspoken and all around a fun person to be around. Money was always a topic of conversation for the both of us as we came from families that were living pay to pay and on welfare. We started budgeting when we were in University which helped us to keep any school debt to a minimum apart from student loans. Most of our education was paid for from savings, summer jobs and odd jobs throughout the years. The problem at least for me was my budget was too basic as it didn’t show me enough information which is why we now use your budget. It’s easier to see the overall picture. That’s only part of our financial concerns solved though. My wife has never lived in her own house before as her family could only afford to rent. I’d love to give her that experience of being a homeowner one day soon. She doesn’t know I’m writing to you today for advice so here goes. After we pay all of our bills every month (rent, groceries, cell phone, cable, gas, vehicle etc.) we have about $5000 left in discretionary income. We both invest in our companies matched retirement plans every pay but we don’t invest in a Tax Free Savings Account (TFSA) or Registered Retirement Savings Plans (RRSP) outside of this but would like to. We don’t want to be renting forever so saving for a down-payment for our first house will be a priority but we also don’t want to be house poor like those recent grads in an earlier post you wrote about. I think that is what scares us the most. My question is how should we budget our $5000 of extra discretionary income every month? We’d like to be homeowners as soon as possible and start a family. Lots to consider and I thought since you kind of went through the same thing that maybe you could shoot me some ideas to transition us financially to reach our home ownership goals with a budget that works. Thanks for writing in to share your financial situation with our CBB readers. You know being house poor as you likely read in my post is not a place you want to be. Too often people jump into home ownership without doing enough research. The thing that scares me and lots of other financially savvy people is the current ultra-low interest rates. So many people are rushing out to buy these monster houses that they may not be able to afford if the rates go up… and they likely will at some point. They won’t last forever, nothing does so don’t be fooled. Let your budget and finances guide you by doing thorough research. What happens if you can’t afford your mortgage payments? What is the back-up plan? What if there is job loss? What if your wife goes on maternity leave? What if one of you passes away? What if one of you has to stay home permanently to care for a disabled child? What if your elderly parent(s) need to move in? There are so many ‘what if’s’ and for many people they would rather deal with it when the time comes BUT if you want to be ahead of that financial tug-of-war you’ll consider these questions and more BEFORE you buy a house. Worst case, you sell your house if you can’t afford it and downsize or go back to renting. There are always options but many come with a price tag. On that note, it seems like you are both doing very well for yourselves and have no debt which is a great start. This is how Mrs. CBB and I started saving for our first down payment. We rented until we had enough saved and then some before we took the leap into home ownership. In no particular order I’m going to talk to you today about things we did when we prepared to buy our first home and how we maintained our home and budget to bring us to debt freedom. You already have the budget in place which is great and you are considering investing for your retirement in a Registered Retirement Savings Plan (RRSP). You can use your RRSP in the First Time Home Buyers Plan (HBP) if you’d like but many people are stashing away cash in a Tax Free Savings Account (TFSA) these days as it’s easier to cash out when needed. It’s your choice in the end though. With the HBP you have up to 15 years to pay your investments back but with a TFSA you just open contribution room in your funds. It’s really your choice. My friend Mark at My Own Advisor recently wrote a great post about saying Good-bye to the Home Buyers Plan and Hello to the TFSA which I recommend you read. I agree with Mark though that a home is not a long-term retirement plan which means you still need to be investing in your retirement future. That means that with your extra $5000 of discretionary income you need to set aside money for your TFSA and RRSP. Since you have a works plan what I would suggest is talking to a financial advisor to go over the ins and outs of investing so you can both decide what will work for you. If you haven’t considered life insurance now is a good time to get something set up. Don’t sign up for mortgage insurance until you understand it fully as it is a reducing balance compared to life insurance which will pay out the full value of the insurance policy. My wife had life insurance well before I moved to Canada until which time I was set up. After we quit smoking though it was amazing to see how much our life insurance rates dropped. We now have life insurance for much less and feel better knowing we are insured in case something happens. Keep in mind there are many other types of insurance you can buy but that’s up to you. Talk to your financial advisor or insurance broker to get their professional opinion but do your own research. Once you have your investments and life insurance in place you will know how much money you have left to play with in the budget or save for your new house. You can also set up a meeting with a bank or mortgage broker to talk about your future mortgage and find out what you could both potentially be approved for with your current income and debt ratio. Consider buying a house that you can afford on one income in case something should happen to the other and save enough to put more than 20% down. This will help avoid paying the newly increased rate issued by the Canada Mortgage and Housing Corporation (CMHC) fees which increased as of June 1, 2015. Effective June 1st, 2015, the mortgage loan insurance premium for homebuyers with less than a 10% down payment will increase by approximately 15%. When we bought our house, the rule was based on a 10% down payment. Anything more than 10% would carry no CMHC fee. We didn’t want to pay this so we rented until we had the cash and then started the hunt for our house. This is only an assumption but the increase in rates and the minimum down payment increase suggests that the CMHC are forecasting a dismal future in the world of home loans. Why else would you have a dramatic increase in payments other than saving it all for a disaster? When considering your budget also keep in mind the state of your vehicles and when you may have to replace them. Will you have the money? If not, can your budget handle car payments? If you want to add a child to the family understand the costs involved with having a baby and living on one income for a year when your wife is on maternity leave or if you take paternity leave. All these factors will come into play when you own your new home so you don’t want to be blind-sided with the obvious if you can semi-prepare for it ahead of time. Let’s not forget what you can’t prepare for and that is emergencies so a portion of that $5000 should be going to an emergency savings fund. Some people like to keep 3-6 months of their budget in savings and others a year. It’s up to you and what makes you feel comfortable. Others may nix the fund by using a line of credit so they can use the cash they have to invest. That’s great if you know what you are doing because some people can earn more investing their money rather than having it sit in the bank. Again, the TFSA is a great place to stash cash and it’s easy to remove when needed or you can set up a separate fund like we have. Your choice. Just a side note: Home maintenance is not an emergency so many people budget a percentage (typically 2%) of the value of their home for these costs each year. This can be a flawed system though depending on where you live because an identical house based in the city may be more expensive than in the countryside but the same house will have different maintenance values as I’ve learned. A thorough example of this is given in the link below. If you aren’t keen on using the percentage values you can also estimate life expectancy of the components of your home that will need replacing at some point. Keep in mind this includes everything from the washing machine to the roof. Using this method you could start saving using the projected expenses in our budget as well. I do agree that we should focus about 5 years ahead of time because anything more than that is a just a wild guess. For example, if you know in 5 years you will need a furnace that will cost you $2000 you can start saving about $33 a month for that in the budget. That way when the time comes to replace the furnace you have the cash ready to go. No debt required. Typically people replace something like a furnace of air conditioning unit through finance and monthly payments. This is usually step number one to funding your life through credit. If you haven’t got the money for a large domestic appliance, what would happen if something slightly more serious occurred? It’s easier to plan for upcoming expenses if you can see the figures in front of you so this is a great way to stay on top of home maintenance and any other projected expenses in your budget. We’ve used this system for years now and it works. As you can imagine owning a home is a BIG deal and unless you do your research and plan ahead as much as possible you will run into problems eventually if you don’t have the cash. I think what you are both doing is smart especially with the budget. Figure out a mortgage you can pay with one income and save for a downpayment to avoid CMHC fees if possible. This is just a short list but some of the critical aspects of owning a home that we would look at. Now that we are mortgage free and we are relatively young building our dream house is an option but may come with a price tag and new mortgage. In the meantime we will enjoy life and save for that potential upcoming expense so we won’t need another mortgage and if we do it won’t be a big one. One thing to get used to is that the bills never end. I hope this helps you out a bit. You will soon see how fast that $5000 of discretionary income will get eaten up but at the same time you are both in a good position starting your life debt free. Good luck with saving for your new home and trying for your first baby. Then you will have to start thinking about setting up a WILL but that’s another blog post. What else should this couple do with their $5000 of discretionary money? Great advice Mr CBB. It’s important to make sure your home will still be affordable after baby. The one thing that I would add is if anybody goes the route of HBP, make sure that they are making more than just the minimum contributions to their RRSP to cover what was withdrawn and keep it growing back to where it should be if the money wasn’t withdrawn. Remember that HBP is still debt, it’s just hidden except for once per year on your tax return.